Want to try an online blackjack game with a difference? Playtech’s 21 Duel Blackjack follows the classic rules of blackjack, but with a few fun twists to add some excitement to standard gameplay. Find out how to play 21 Duel Blackjack for real money bets at the best casinos on the Web. Note: The information provided below is intended for our international readers only. As of September 2017, online casinos are banned from offering their services to Australian players following the introduction of the Interactive Gambling Amendment Bill 2016, so for Australians the content on this page is informational in nature only. Playtech’s 21 Duel Blackjack is a multi-hand game, allowing you to play up to three hands at once. Like traditional blackjack, the aim of 21 Duel Blackjack is to get a hand that’s closer to 21 than the dealers, without going bust. Cards use standard blackjack values, where face cards count for 10 points, number cards count for their face value and aces can count for either one or 11 points. Six decks of standard playing cards are used, excluding jokers. There are two major differences in 21 Duel Blackjack. 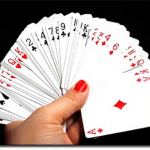 The first is that all hands that create a total of 21 are considered equal, whether they’re made up of a natural blackjack (an ace plus a 10 valued card) or a three card hand (for example, a six, a seven and an eight). Secondly, after you’ve placed your ante bet and been dealt your first card, you either fold or choose one of two community cards to add to your hand. You can combine one or two of your cards with one or two of the communal cards to form your final hand, so there’s a little bit more strategy required than traditional blackjack. 21 Duel Blackjack also offers an optional Two-Up side bet. 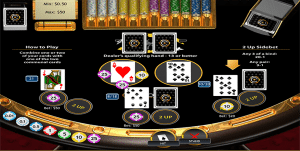 Click on the betting chips at the bottom left hand side of the table to select the size of your wager, and move the chip to the ‘ante’ space on the betting table. Keep in mind that if you stay in the game after your first card is revealed, you need to place an additional wager equal to your initial ante bet, so make sure there’s enough funds in your bankroll to cover this. Place an additional chip in the Two-Up space if you wish to play this optional side bet. Hit the deal button and you’ll be dealt one face-up and one face-down card, while the dealer will be dealt two face-down cards. Two face-up community cards will be dealt to the middle of the table, to be used by both you and the dealer. You now have two options. You can either fold to forfeit your ante bet, or click the left or right card button to choose which one of the communal cards to add to your hand. The total value of your face-up and community card hand will now be shown and you have two options: click the hit button to add your face-down card to your hand, or click the stand button to discard your face-down card and continue playing with your two card hand. The dealer now reveals one card and chooses one community card. If their hand has a value higher than 12 and is higher than yours, the dealer wins and you lose your bet. If your hand is higher, you win. 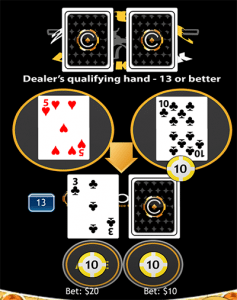 If the dealers hand is lower than 13, you win regardless of whether your hand is better than theirs. It both of your hands are equal value, it’s considered a push and your bets are returned to your bankroll. Two-Up is an optional side bet that allows you to place an additional wager on the result of the first three cards shown on the table – your first face up card and the two community cards. The bet is that these cards will contain either a matching pair of any suit, or a Three of a Kind, which is three identical cards of any suit. The amount of your Two-Up side bet can be of a different value to your ante bet, and you can win or lose this bet regardless of the results of your ante hand. Casino.com offers 21 Duel Blackjack with a minimum bet of $0.50 and maximum bets capped at $50.00. The theoretical percentage return to player (RTP) is 98.38% on the main game and 93.47% on the Two-Up side bet. A winning blackjack hand will earn you double the amount of your initial ante, while a winning Two-Up bet will earn you a payout 20 to 1 on any Three of a Kind, or 3 to 1 on any pair. Playtech’s 21 Duel Blackjack game is available to play at Casino.com, one of our top rated online casinos for real money blackjack. While Casino.com accepts deposits using a range of trusted payment methods, players can also try 21 Duel for free in practice mode so you can get your head around the game before risking any of your own money. You’ll also find a great range of other blackjack variants on offer here, including Multiplayer Blackjack, Blackjack Surrender, Perfect Blackjack, Blackjack Switch, Double Attack Blackjack and more. 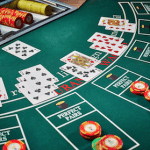 All blackjack games at Casino.com are available for instant-play directly over your Web browser, or by downloading the venue’s exclusive casino software. New to Casino.com? Sign up to play 21 Duel Blackjack for real money bets and Casino.com will double the amount of your first deposit up to a value of $400, plus you’ll get access to a range of player-only promotions and benefits.